The White Mountains, which include the highest elevation in the northeastern US, are largely protected by public lands, both state parks and the vast swath of the White Mountain National Forest. The campgrounds in each of these provide hundreds of campsites for both tents and RVs, and offer varying types of facilities, from fairly primitive sites to those in more highly developed parks. 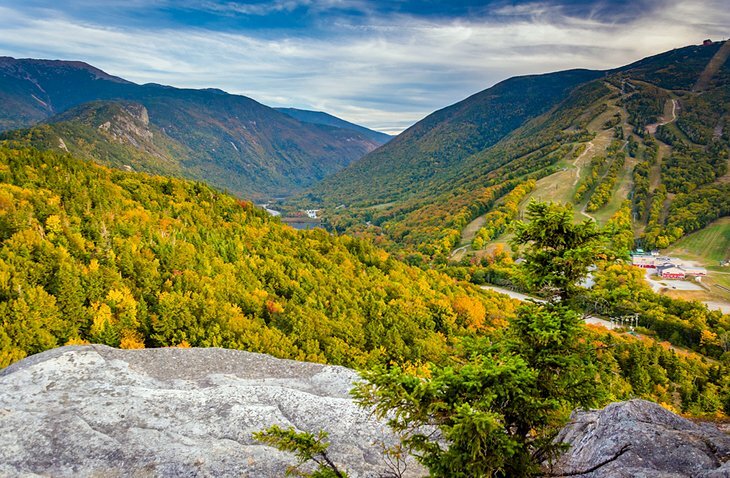 These White Mountain campgrounds are especially popular because they are close to excellent hiking and mountain climbing, as well as some of the state’s most popular tourist attractions, including The Mount Washington Cog Railway and several other mountaintop rides. Elsewhere in the state, several state parks and private campgrounds are located on lakes with swimming beaches and water sports. You can reserve sites online in advance at most of these campgrounds. The National Forest campgrounds offer significant discounts to holders of America the Beautiful and Golden Age passes, and the fee covers up to eight people of any age. New Hampshire State Parks allows only a maximum of two adults and four children per site, with additional charges for extra people, so larger families or those with adult children are better at National Forest campgrounds. Many places you may see advertised as campgrounds are RV parks with seasonal sites only and no overnights or tents allowed. Nearly all state and National Forest parks have sites for both, although they don’t always have hookups for RVs. In the heart of one of New Hampshire’s two most scenic notches (glacially carved mountain passes), Lafayette Place Campground is part of Franconia Notch State Park, a perfect base for hiking (the Appalachian Trail passes through the notch) and exploring the many natural attractions of the White Mountains. The eight-mile valley between the high peaks of the Kinsman and Franconia mountain ranges includes the Flume Gorge, the Cannon Mountain Aerial Tramway, the New England Ski Museum, a swimming beach at Echo Lake, fly fishing at Profile Lake, a recreational trail for cyclists, several waterfalls, and places to spot hawks and falcons. Free interpretive nature programs help campers of all ages learn more about the region’s natural environment. The 97 wooded campsites for tents and RVs are large, and all have fireplaces. The campground is open all year, but showers and other services are only open mid-May through mid-October.